Home Heavy Vehicles Has Isuzu hit the sweet spot with its new eight-pallet light truck? 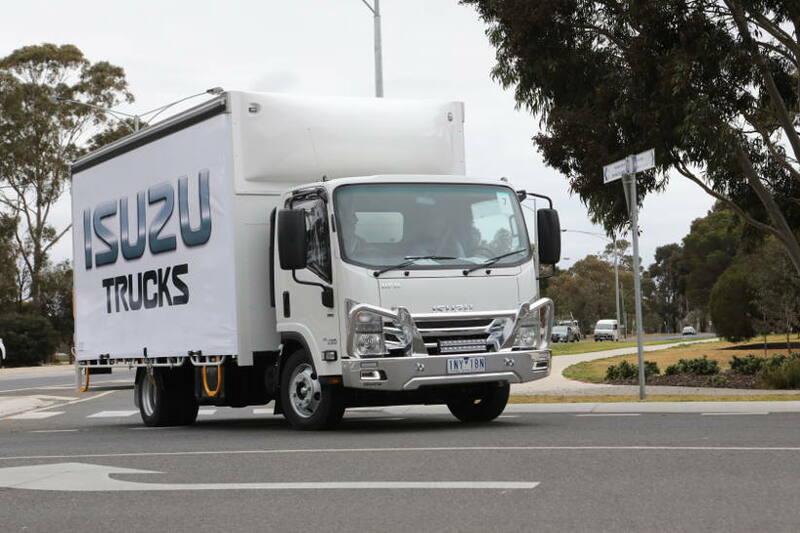 Isuzu Australia thinks it may have hit a “sweet spot” with the introduction of two new light trucks with a body wide and long enough to hold eight pallets. They are the first light rigid trucks capable of such a capacity in Australia. The models are the NPR 75-190 and the NQR 90/80-190. Productivity is the key word here. Australia’s freight task is projected to double in the next 20 years, according to analysis conducted for Inquiry into National Freight and Supply Chain Priorities, published in March by the Australian Government’s Department of Infrastructure, Regional Development and Cities. Meanwhile, congestion in cities is another problem that requires a multitude of responses, and having a light truck carrying more is one appropriate answer to the challenge. To drive the Isuzu eight-pallet models, an operator only needs a light rigid licence. Such a licence takes an hour’s training and costs up to $130 in NSW, making it accessible for new entrants into the delivery and transport industry. “A lot of people buy their way into this industry, including newly arrived immigrants. It’s a perfect occupation for new emigrants doing the last-mile deliveries,” said Chamberlin. These 3815 mm length N Series trucks gives such operators more bang for their buck. Chamberlin said the redesign for a longer wheel-base on these models in the Isuzu popular N Series of trucks started two years ago. “We listened to customers and they said this is the one that can work for us,” Chamberlin said, as we drove in the vehicle through Melbourne as part of a media event to introduce the updated N Series launched earlier this month. “This is a last-mile delivery solution,” he said. All models in the new N series come with cruise control and a new audio-visual system featuring a touch-screen. Service intervals have been extended to 12 months. Another key element of the new N series range is the addition of independent front suspension on key models, including the NPR and NQR models featured in this report. IFS improves ride quality and handling, bringing a more car-like drive experience. “This improvement is coupled with a new rack and pinion type steering box, delivering sharper steering response, and overall, a more enjoyable driving experience,” said Simon Humphries, Isuzu Australia’s chief engineer. To be sure, Isuzu says it will take a while before they know, maybe a year, what the genuine demand is for the eight-pallet body build. “It could be 12 months before you start to see a trend emerge,” said John Walker, marketing and customer experience group head at Isuzu. If Isuzu has got it right, the rewards could be great.